Dramatic scenes of devastation and suffering caused by disasters such as the 2011 Japanese earthquake and tsunami, are viewed with shock and horror by millions of us across the world. What we rarely see, however, are the international politics of disaster aid, mitigation and prevention that condition the collective response to natural catastrophes around the world. In this book, respected Canadian environmental sociologist John Hannigan argues that the global community of nations has failed time and again in establishing an effective and binding multilateral mechanism for coping with disasters, especially in the more vulnerable countries of the South. 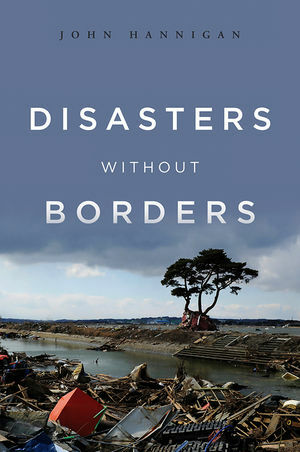 Written in an accessible and even-handed manner, Disasters without Borders it is the first comprehensive account of the key milestones, debates, controversies and research relating to the international politics of natural disasters. Tracing the historical evolution of this policy field from its humanitarian origins in WWI right up to current efforts to cast climate change as the prime global driver of disaster risk, it highlights the ongoing mismatch between the way disaster has been conceptualised and the institutional architecture in place to manage it. The book’s bold conclusion predicts the confluence of four emerging trends - politicisation/militarisation, catastrophic scenario building, privatisation of risk, and quantification, which could create a new system of disaster management wherein 'insurance logic' will replace humanitarian concern as the guiding principle. Disasters Without Borders is an ideal introductory text for students, lecturers and practitioners in the fields of international development studies, disaster management, politics and international affairs, and environmental geography/sociology. John Hannigan is a Professor of Sociology at the University of Toronto. "An enjoyable, easily accessible read." "This fluent, critical and accessible book provides a wealth of detail and insight into the political and social pressures that shape discourse, international organization and policy for disaster management. A strongly recommended text for students of humanitarianism, disaster risk management, and international development policy, and a wake-up call for practitioners." "This volume highlights the interplay of normative, political, and institutional factors steering how we conceptualize and respond to disasters. As such it provides readers with an understanding of how actors at different levels actually make sense of disasters, a perspective that is rarely explored in the current literature." "...comprehensive and applicable to any border region. The book is easy to read..."
"An important read for researchers and advanced students interested in the politics of international emergency management and disaster assistance." Natural disasters regularly reach a high degree of prominence in the media, but we rarely see the political aspects of the ways that disasters are managed and dealt with. This book offers a comprehensive survey of the political history of disaster management, from World War I onwards.